Kids are a curious bunch and as they turn into toddlers, their curiosity levels grow leaps and bounds just like themselves. One always wonders what could be the best way for kids to learn in a fun and safe environment. In addition to different kinds of skills, it is very important for kids to be adept at life skills too. Toddlers love to imitate their parents and also people around them. If your child has shown an interest in driving, while watching you drive, then gifting your kid a little vehicle of their own would be a great way to develop some of their skills such as coordination, sensory and motor skills. Driving any gas or electric ATV for kids should always be done under adult supervision for maximum safety. Keeping this is mind; Best Choice Products have come up with the perfect electric four-wheeler for kids: their Kids ATV Quad 4 Wheeler Ride On. Durable: The body of this electric four-wheeler for kids is made of plastic. This makes it light and durable. Since it is lightweight, it can be easily transported from one place to another without any hassle. Your kids can ride this anytime. Speed: With its 15-watt motor, this four-wheeler can reach speeds up to 2 mph. It also moves easily in both directions i.e. forward and reverse. It is also easy to make turns and moving around the block can be simple even for kids who have been newly introduced to riding. Battery: This electric ATV for kids uses a 12V battery and the charger is included to make sure your kids can ride for hours. All you need to do is to plug it in and wait for the battery to charge so that your kids can enjoy non-stop riding with friends. Attractive looks: With an attractive design and bright LED headlights, kids would love to use this four-wheeler all the time. It is flashy, shiny and that’s the reason that not only kids but youngsters will love to flaunt this electric four-wheeler too. Foot pedal: A foot pedal is also provided for acceleration so that kids can enjoy the riding experience to the fullest. Kids will love it when they learn the concept of how fast or slow they can go, and it will encourage imaginative play. Recommended age: This is recommended for children above the age of 3 years and its maximum weight capacity is 66 lbs. No FM radio: This four-wheeler has no FM radio unlike some of the other models in this category. Few color options: Even though it is a great product, there are not many color options to choose from. Safe: Unlike some of it competitors, such as the electric 4 wheeler Razor, this electric four-wheeler for kids can reach up to speeds of 2 mph. This makes it very safe for kids to use. Light: The weight of this four-wheeler is 25 lbs. and this makes it one of the lightest and best four-wheelers for kids. Easy to operate: This electric ATV for kids can travel forward as well as in reverse. The direction can easily be changed by the simple use of a switch. Great looks: The attractive design, shiny bright headlights and the mimicking sound of a real engine when you turn the key on make it very attractive to kids. Long hours of use: With a 12V battery that can be easily recharged, kids will never have a reason to stop using this electric four-wheeler for kids. The battery can run for hours without any problem. 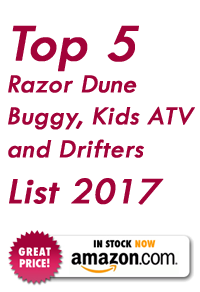 Reasonably priced: It might be priced more reasonably than other models of this category but its features and superior quality make it one of the most loved electric four-wheelers. Silent and environment friendly: Since this is an electric four-wheeler, not only is it environment friendly but is also much more silent when in use than a gas ATV for toddlers. They are also cost effective and efficient. The number of choices available today in the category of electric four-wheeler for adults, can be limitless. However, nowadays the kids segment in this same category is not too far behind with such a wide variety of options to choose from when it comes to buying an electric four-wheeler for kids. One of the main choices a parent has to make when choosing a electric ATV for kids is if they should go for an electric one or buy a gas ATV for toddlers. This decision is based on a number of factors and its important to consider all of them before buying something best suited for your kids. Electric four-wheelers are less noisy, environment friendly and also very cost efficient. They are easier to maintain that the gas ATV for toddlers. The acceleration of the electric four-wheelers is better than some of the models in use before and they are also lighter and more compact. The Best Choice Products Kids ATV 4 Wheeler Ride On is a great product if you want your kids to love the outdoors and get them to experience some riding action. This electric four-wheeler for kids is a combination of durability and safety at a very affordable price. With the speeds of up to 2 mph, it is extremely safe to learn and ride. It comes with a choice of two colors, red and black, which are universally appealing and with its attractive LED headlights, it will surely make heads turn. It is one of the most lightweight electric four-wheelers available today and with a weight capacity of 66 lbs. it makes sure that even older kids would enjoy cruising around on this. It has a simple switch to turn it on and off and when the kids learn how to stop and go, it helps them to learn the concept of spatial and logical thinking. This four-wheeler also moves both in forward and reverse, which helps kids understand directionality. The younger kids will love to explore all its great features and it will be a great exercise for their mental stimulation. As they grow older and use this electric ATV for kids, they would love to ride it around and you could engage them in imaginative play. Letting kids learn how to ride an electric four-wheeler like the Best Choice Products Kids ATV 4 Wheeler Ride On would also introduce them to following rules and regulations so they understand the importance of safe riding. Since this electric four-wheeler for kids is easy to maneuver, you can make riding time exciting by making a pretend obstacle course for them to complete. It will test the kids and add excitement to the experience. It is also a great tool to teach your kids about traffic signs by placing some pretend signs around your home. They would also love riding with friends and having road rallies in the backyard under an adult’s supervision. This electric ATV for kids is very popular and it features on all major websites as one of the best electric four wheeler for kids due its high rating and extremely positive reviews. 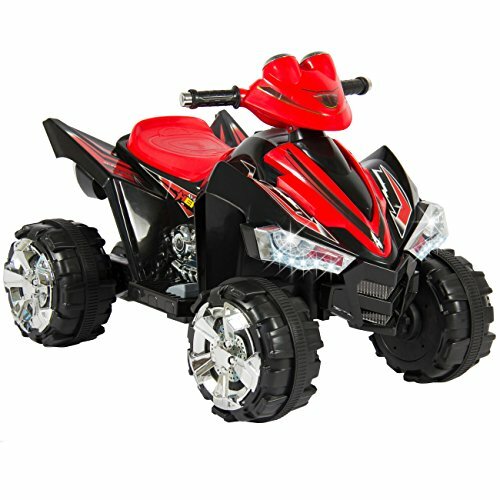 If you have been thinking about buying a toy for the all-round development of your child along with them learning some great skills and having fun, then the Best Choice Products Kids ATV 4 Wheeler Ride On is the product you need. Watch your kids become confident and independent while having a fun and exciting riding experience with the Best Choice Products Kids ATV 4 Wheeler Ride On.